Crane duty motors are specially designed for frequent starts/stops & reversing required in cranes & lifts of all types. They can also be used in applications such as material handling, weirs & sluices, auxiliary motors in rolling mills or wherever intermittent drives are required. Castings: Crane duty motors’ housings & end shields are made from high quality castings as per IS 210. All components are machined to correct accuracy & alignment. Stampings: The stampings are made from low loss high permeability steel. Terminal Box: Standard location of terminal box is on top. However the terminal box on right or left side can be provided on request. The terminal box can be rotated in steps of 90° in each position. Motors up to 250 frames have aluminium boxes whereas frames 280 & 315 are with cast iron terminal boxes as standard. Cast iron terminal boxes up to frames 250 can also be provided on request. Winding & Protection: All motors are wound with super enameled dual coat copper wires. 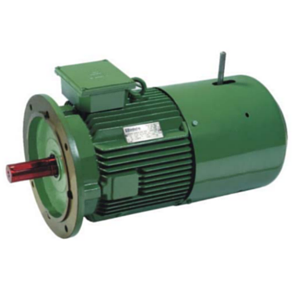 This enable motors to be used for inverter applications as well. Features like vacuum pressure impregnation (VPI) & PTC thermisters embedded in stator winding can be provided on request. Earthing terminals: Two earthing terminals are provided, one in the terminal box & other on the motor body. Anti-condensation Heater: To avoid moisture accumulation inside the motor, the motor windings can be heated by connecting 4-10% of rated voltage to the motor terminals. This will generate enough heat equivalent to 20-25% of rated current. Alternatively any method as described in IS: 900 can be used. Motor can also be offered with space heaters on request for frames 90 & above. These motors can be supplied with integral electromagnetic DC fail safe brakes with built in rectifiers for frames up to frames 250MX. Flameproof motors:“Hindustan” crane duty motors are also available with flameproof enclosures.